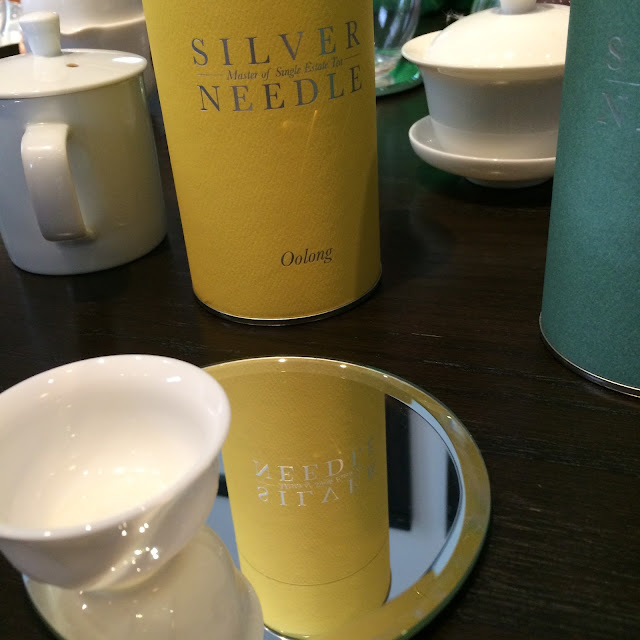 Tea Tasting with Silver Needle Tea Co. Almost a month ago I had the pleasure of a tea tasting with Lucy of Silver Needle Tea Co. and Sara of Tea Happiness. Over three teas we talked about teas, of course, product design, travel, and family. Lucy used various tea-ware to prepare Dragon Well (Spring 2015), Big Red Robe, and Golden Eyebrow. 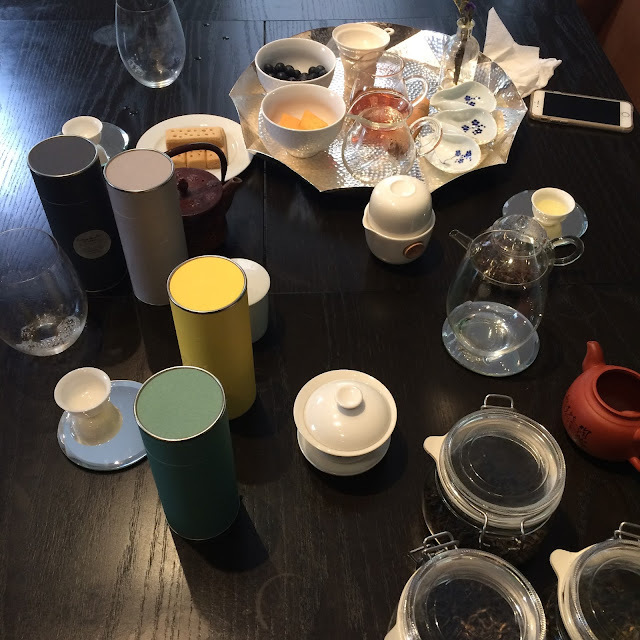 The teas were served in ceramic cups and stemless glassware. First, the Golden Eyebrow (Jin Jun Mei). My notes read, "So much chocolate!" Enough said about this Wuyi lapsing souchong. On to the other tea from Wuyi. The Big Red Robe (Da Hong Pao) also has notes of (dark) chocolate both flavor and aroma-wise. On the tongue it was dry and sweet like cherries with notes of caramel and campfire. Typical of Wuyi oolongs, the leaves of the Big Red Robe are twisted not rolled. The first tea we drank was a Spring 2015 Dragon Well (Long Jing). It was buttery and really great on the second steep. 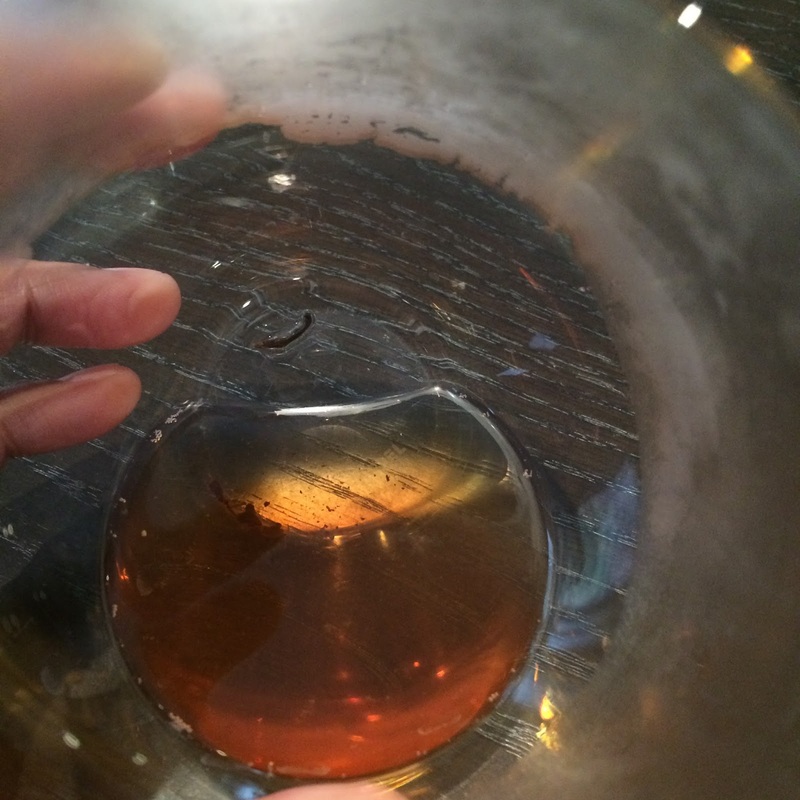 Lucy noted that in general second steepings are "like a person -- warmer the second time you meet them." The next time you see a Silver Needle Tea Co. canister up close, take many moments to appreciate its construction. Lucy described the iterative design process as very intense. The canister is a telescoping column with colors specific to tea type and embossed labelling. 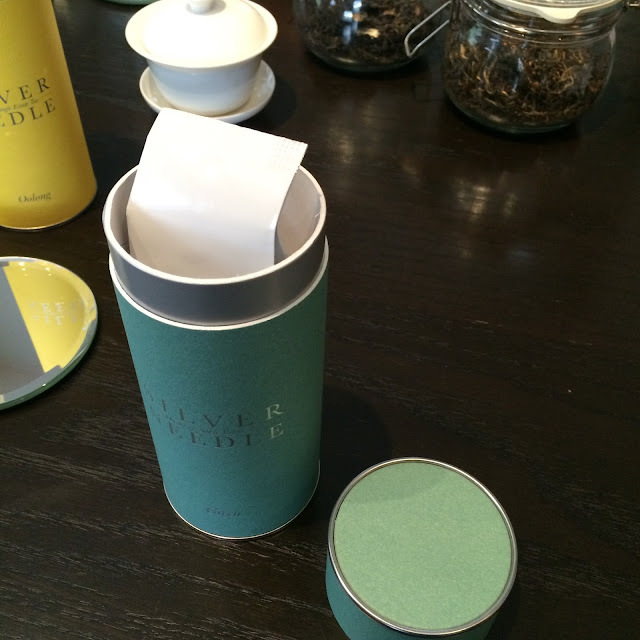 What a keepsake if you got the Complete Experience of four whole leaf teas in the company's signature canisters! Lucy was kind enough to give a Jetsetter Tea Set on parting. While I haven't prepared any of the sachets yet, I like opening the tin and breathing deeply of the big aromas of oolong and black teas contained within this small package. Thank you Lucy for taking the time to drink and talk tea with me (and Sara). Nice write-up! I enjoyed reading your thoughts on our afternoon of tasting delicious teas. Look forward to your post, Sara!